This paper explores six stages which need to happen for serendipity to have occurred, the features of each stage and ways maximize the potential for serendipity. If you search for 'iteration' on the web you will find precious little outside the domain of mathematics and computing. And yet iteration is commonly seen in nature as a way for organisms to grow and develop and as a change process in an increasing number of psychotherapeutic procedures. So what is iteration and how can we make use of it? These are unpublished notes written for The Developing Group. The quadrants provide a sense of the holographic nature of problem domains and provide a context for understanding how the mechanisms function in a matrix of space and time. The objective of this therapy is to find a solution to a particular problem domain by tracing the undesirable symptom back through time to its originator. A powerful 'redemptive metaphor' can then be discovered prior to the origination that can be utilized to heal the etiology and its entire evolution into the client's life. Psychotherapy has a history of imposing external patterns (the therapist's) on internal experience (the client's). But working with clean language and autogenic (self-generated) metaphor, complex patterns can be codified into relatively simple configurations which can be explored by the client with minimal interference by the therapist and then more effectively transformed. My purpose in this paper (split into two parts) is to help you identify patterns and to consider ways of facilitating clients to discern, decode and resolve them through clean language and autogenic metaphor. 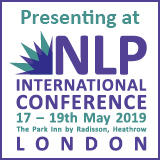 A model that finds a place for three NLP language models - Meta, Milton and Sleight-of-Mouth - in the context of an NLP-derived fourth model - Metaphor - which I happen to believe is the most fundamental and far-reaching of all.